Fun with small sample sizes: The most extroverted city in the US is Keota, Iowa. Keota has 1,009 people. The cutoff for being included in this study was, supposedly, 1,000 people. This is the same effect that I mentioned last week with regard to Amazon’s best-read cities list, and again I wouldn’t be surprised if the most introverted cities are also very small. The Des Moines Register article says that pyco plans to release this list as well. Clustering of college graduates: is it getting worse? An article in today’s New York Times, by Sabrina Tavernise, is entitled As College Grads Cluster, Some Cities Are Left Behind. A lot of old US cities with economies that used to be based on manufacturing are having trouble making the transition to our current, post-manufacturing economy. And one difficulty such cities face is a lack of college graduates. Historically, most American cities had relatively similar shares of college graduates, in part because fewer people went to college. In 1970, the difference between the most-educated and least-educated cities, in terms of the portion of residents with four-year degrees, was 16 percentage points, and nearly all metro areas were within 5 points of the average. Today the spread is double that, and only half of all metro areas are within 5 points of the average, the Brookings research shows. But what does “relatively similar” mean here? The proportion of adults in metropolitan areas that have college degrees, according to the accompanying infographic, has risen from 12% in 1970 to 32% in 2010. I would guess that a city with, say, 9% college graduates in 1970 is comparable to a city with 24% college graduates in 2010 — both have three-fourths of the average. Indeed, from the infographic you can also get the actual distribution of the percentage of college graduates in each of the metro areas in question. (The study includes 100 metro areas in each of 1970 and 2010.) 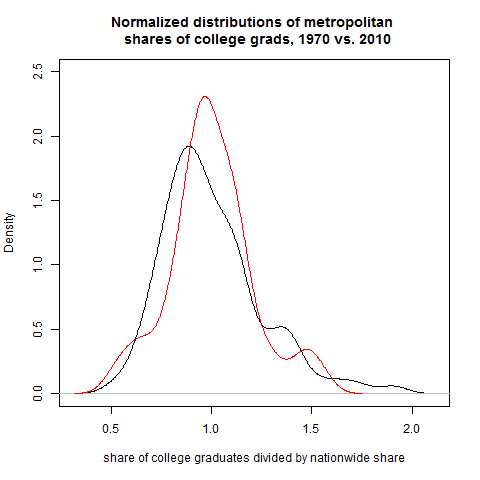 In 1970 the average metropolitan area had 11.5 percent college graduates, with SD 2.9 percent; the standard deviation is 25 percent of the mean. In 2010 the average metropolitan area had 29.4 percent college graduates, with SD 6.2 percent; the standard deviation is 21 percent of the mean. In these terms, the disparity has gotten smaller! If we make histograms of these normalized shares for 1970 and 2010 and superimpose them, we get the plot below. Black is 1970, red is 2010. The distribution gets narrower, not wider, as time passes when viewed on this scale. I don’t mean to take away from the fact that this disparity exists between metropolitan areas. But the real problem is probably not so much that the educational disparity is growing as that the returns to a college education are larger with the departure of manufacturing jobs. Matt Yglesias has commented on this from an economic point of view, echoing some points that Enrico Moretti makes in The New Geography of Jobs. In particular, what’s the point of states funding public education if people are just going to move away from those states? Edited to add, 4:49 pm: Junk Charts comments on the graphic itself. Inspirations, a short mathematical film by Cristobál Vila, who works in computer graphics. The underlying conceit is “what might Escher’s workplace look like?”, although in a completely imaginary sense. Nature by numbers is similarly impressive, featuring animations of the appearance of the Fibonacci sequence in phyllotaxis. These aren’t really “educational” videos — you won’t learn anything from them if you don’t recognize what’s going on already — but some of you may recognize what’s going on, and if you don’t Vila has produced pages on the mathematics behind Inspirations and Nature by numbers. An excellent metafilter post has links to lots of different types of graph paper. Why bubbles sink in Guinness. A lecture by Steve Strogatz on social networks, one of the 2011 Simons lectures. A free online forecasting textbook (under construction) by Rob Hyndman and George Athanasopoulos. A metafilter thread on the history of the stockbroker scam. Seen in a Mexican restaurant: fajita meal for three, $36. For four, $48. For five, $60. They then offer the helpful suggestion that if your group has nine people, you could order the fajita meal for four and the fajita meal for five, and you’d be set. Of course this is exactly the same as saying that the fajita meal is $12 per person, minimum of three people, since any integer that’s at least three can be written as a sum of threes, fours, and fives. Via Berkeleyside, I learned about Amazon.com’s best-read cities list. The top five are Alexandria, VA; Cambridge, MA; Berkeley, CA; Ann Arbor, MI; Boulder, CO. The populations (2010 Census estimates) of these cities are 139,966; 105,162; 112,580; 113,934; and 97,385. You won’t be surprised, then, to learn that the survey only includes cities with populations of over 100,000. A lot of these very high-ranked cities barely get over that line. Amazon hasn’t released the whole list as far as I can tell, but I would suspect that the worst-read cities of population also are just barely over 100,000 in population. To be fair, I’ve cherry-picked a bit here; #6 Miami and #9 Washington, D. C., for example, are quite a bit larger than 100,000. But we expect larger deviations from the norm in smaller samples. I wouldn’t be surprised to learn that, say, some 100,000-person portion of San Francisco or Boston is better-read than Berkeley or Cambridge. Perhaps the list of most well-read zip codes, then, would be more revealing.